I wonder if we aren’t all a little bit like that boy. We enjoy the way we are right now. As I said last week, we are as mature as we want to be. When you say “I can’t” do you really believe you are not able or you are you saying “I don’t want to”? I have come to the conclusion that “I can’t” either means “I don’t want to” or else people sincerely believe that they are physically or emotionally or spiritually unable to perform a task. There is an attitude in many Christians today of doubt and unbelief, and a lack of trust and faith in God. It is an attitude from the devil and is not of God. The devil would have us to think that we are worthless, cannot do anything, and that God is a God of small things. We should have the same attitude as Paul. Paul encourages the church at Philippi that no matter what they may be going through, that they can do all things through Christ. And God wants us to have a “Yes I can” attitude today, no matter what we’re facing. So, the question I pose to you today is; "How do we get over the "I can’t" attitude? First, we need to recognize that our ultimate, all in all strength, is found in God and God alone. Apart from Jesus, we really can’t do anything, but when we get filled with the ultimate power source, we can do all things according to His will and His purpose. The Holy Spirit is the ultimate strength and the source is Jesus Christ. We don’t have to be concerned whether or not we have what it takes to be mature in Christ, to be like Jesus. God uses ordinary people and makes them extraordinary by His power and grace. God seldom uses the mighty, the powerful, or the influential. Too often, such people are too full of themselves to be useful to God. As Jesus reminded his disciples, John 15:5 “Apart from me you can do nothing”, The Old Testament prophet declared, Zech. 4:6 “Not by might nor by power, but by my Spirit,’ says the LORD Almighty”. Therefore, God is telling us that it’s not about us! It’s all about HIM! We can be all He commands us to be because He enables us, He gives us the power. Secondly, too often we say “I can’t” because we lose faith in God due to fear and anxiety. We fear trying new things. So because of a fear of the unknown, we tell ourselves "I can’t."! Fear does not come from God. 2Tim 1:7 For God did not give us a spirit of fear and timidity, but a spirit of power, of love and of self-discipline. As we study the scriptures, we find that there were some great men of God who succumbed to this kind of fear and initially said “I can’t”. There was Moses who tried to disqualify himself from the call of God, to go to Pharaoh and tell him to let God’s people go, because he had a speech impediment. There was Jeremiah who tried to run from the call of God, saying that he was just a child and that he was not ready for such a great responsibility. Then there was Gideon who argued with God that he was the least qualified of anyone to deliver God’s people. Likewise, ten of the twelve spies returned to Israel with a negative report about the Promised Land, and their fear and unbelief infected and weakened the spirit of the whole nation. They all had different excuses, but they were all saying the same thing (we can’t do it). Words have power. They are like containers (You either fill them with faith and courage and confidence, or you fill them with fear and doubt and unbelief). What we tell ourselves and what we say to others has a powerful affect. When the spies spoke the words “we can’t do it” they excluded God. Their words were full of unbelief and fear. Their words were void of the power of God. Therefore, we must realize the POWER God has bestowed upon us. Fear and anxiety are tools of the enemy, and we need to use the power God has given us to defeat the devil and his lies. The devil is so afraid of what will happen when we begin to do what God says, that he does everything in his power to strip us of our faith. He knows that we are now the righteousness of God in Christ Jesus, He knows that our body is the temple of the Holy Spirit. He knows that the same spirit that raised up Jesus from the dead lives in us. He just doesn’t want us to know it. So he makes us afraid of failure and of the unknown. To move in the supernatural, we have to be willing to follow Jesus outside our comfort zone. To take hold of the power of God, we have to let go of religion, tradition, the past, our pride, and self-preservation. We are never going to be mature and act like Jesus until we think like Jesus. Therefore, we are even going to have to lose our minds to get the mind of Christ. Perhaps you are saying, “We know we’re not perfect and there is only a couple of little things that we know we should change, but we are working on it”. It is interesting, but Paul never suggested that we “change”; he said we are to be “transformed”. Change is temporary, but transformation is permanent. The word “change” is for those who aren’t very serious about their faith - “transformation” is what God is looking for! God wants an extreme makeover! We are in a spiritual battle for our minds. The temptation is to conform to the thinking of the world. Constantly we are bombarded with the philosophy of the world and the devil. It is wearisome to constantly resist, but God has given us divine power, the Holy Spirit, to renew our minds, defeat the enemy, and win the war. One day Jesus’ disciples could not drive a demon out of a boy. They asked Jesus why. Matt 17:20 "He replied, "Because you have so little faith. I tell you the truth, if you have faith as small as a mustard seed, you can say to this mountain, 'Move from here to there' and it will move. Nothing will be impossible for you. " So what is faith? Hebrews 11:1 Now faith is being sure of what we hope for and certain of what we do not see. We must have faith in God, whom we don’t see yet. Faith in God changes our language - what we say to ourselves - and, what we say to others! Faith, my brothers and sisters, is not fantasy - it does not say we can do whatever we imagine! We could imagine jumping off a cliff and flying; however, that is not faith. Faith says that we can do whatever Almighty God wants us to do! Faith in God empowers us to see the invisible - empowers us to love the unlovable - empowers us to endure the unbearable - empowers us to think the unthinkable - and, empowers us to do the impossible! So start letting GOD do through you what He will, and start overcoming the things He has freed you from! It’s not by our own doing, but by the Holy Spirit we receive through Jesus Christ that enables us to do far more than we could ever see ourselves capable of doing. Do you think that God wouldn’t do for you what he did for Paul and countless others mentioned in the Bible? The Bible says that He is not a respecter of persons! Remember, Paul wasn’t even one of the disciples, he didn’t participate in Jesus’ ministry while He was here on earth; he didn’t help the cause at all. In fact, he did the exact opposite; he was the leader of the anti-Christian movement. He made it his goal to seek out, identify, persecute and kill Christians. Then one day while he was on his way to Damascus, he was blinded by the light of Jesus and heard Jesus speak to him. His life would never be the same from that moment on! By the grace of God, Paul accomplished amazing feats for the Kingdom of God. He was a major contributing author of several books in the New Testament! He went from being one of the main persecutors of the Gospel, to being one of the main presenters of it. Paul wasn’t an eloquent speaker, but he believed “I can do all things through Christ who strengthens me.” He preached about the grace of God through Jesus Christ by the power of the Holy Spirit, and God blessed his endeavors greatly because of it! For the ones who are willing to completely trust God at His word, there is nothing, absolutely nothing that can’t be accomplished! We can depend on Him to help us accomplish His will. God loves to work through His people. In the end, you are the only one who can limit God and how He works in your life, only you! Eph 3:20 Now to him who is able to do immeasurably more than all we ask or imagine, according to his power that is at work within us, to him be glory in the church and in Christ Jesus throughout all generations, for ever and ever! Amen. 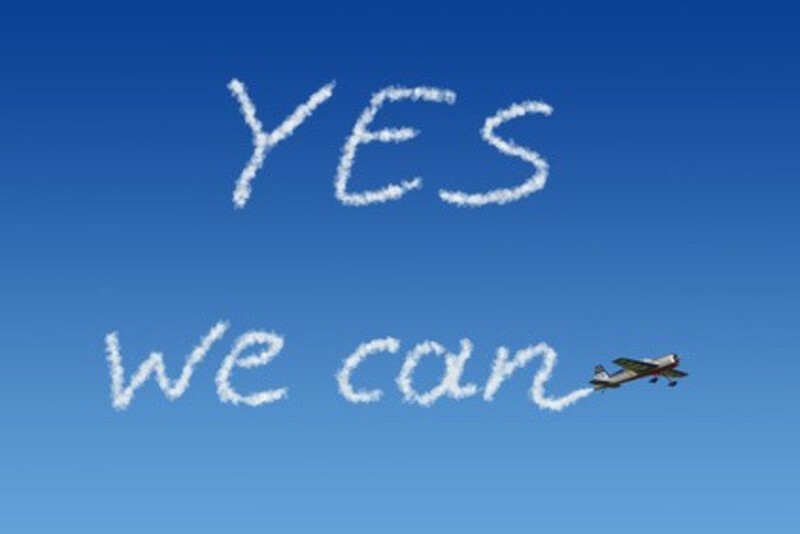 Yes, we can! We have no excuse, brothers and sisters. We can do what God says. We don’t have to sin. We don’t have to be controlled by a habit. We can be filled with the Holy Spirit and be like Jesus. We can be fishers of men. Although we can do nothing apart from Jesus Christ, we can do all things through Christ who strengthens us! Therefore, whatever you need today to accomplish God’s will in your life--the Holy Spirit, faith, wisdom--ask for it and receive it by believing God’s promises in His Word. Then follow Jesus and do what He says by the power of the Holy Spirit. If you need to make Jesus Christ your Lord and Savior, Rom 10:9-10 says, “ That if you confess with your mouth, "Jesus is Lord," and believe in your heart that God raised him from the dead, you will be saved. For it is with your heart that you believe and are justified, and it is with your mouth that you confess and are saved. Confess, believe, repent, and be baptized so that you can be saved, forgiven, born-again, and filled with the Holy Spirit.